Passed out of House Committee on Education and the Workforce on Dec. 13, 2017; Awaiting Consideration by House of Representatives. December 8, 2017 - In a letter sent to members of the House Committee on Education and the Workforce, NASFAA said that while it supports several provisions in the reauthorization bill, some "serious concerns and questions" remain regarding others. Decemer 1, 2017 - Republican members of the House of Representatives Committee on Education and Workforce released a 542-page bill that seeks to improve postsecondary education during the upcoming reauthorization of the Higher Education Act of 1965, as amended. January 17, 2018 - To assist in advocacy surrounding HEA reauthorization, NASFAA has assembled several resources, including this new one-pager outlining positive and negative provisions in the bill, which highlights feedback from NASFAA’s letter to the committee sent in December. January 12, 2018 - In a special episode of "Off The Cuff," Justin, Megan, Stephen, and Karen answer member questions on the House Republicans' Higher Education Act reauthorization bill, the PROSPER Act. Following up on a mid-December webinar focused on the basics of the new bill, members of the policy team dig into more specific questions on some of the bill's provisions. December 21, 2017 - This article is the fifth in a series that delves into Title IV-related issues contained in the PROSPER Act. December 20, 2017 - This article is the fourth in a series that delves into Title IV-related issues contained in the PROSPER Act. December 14, 2017 - This article is the third in a series that delves into Title IV-related issues contained in the PROSPER Act. December 13, 2017 - This article is the second in a series that delves into Title IV-related issues contained in the PROSPER Act. December 8, 2017 - This article is the first in a series that delves into Title IV-related issues contained in the PROSPER Act. December 4, 2017 - Republican members of the House education committee on Friday introduced a 542-page bill that would significantly reshape how students apply for and receive federal financial aid. February 9, 2018 - The Congressional Budget Office (CBO) released a cost estimate on Tuesday, February 7 for the PROSPER Act. In total, the bill, if enacted as written, would result in a net loss in student aid of approximately $15 billion over 10 years. 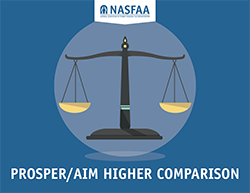 January 23, 2018 - With potential action on the HEA pending in both chambers for the first time in almost a decade, NASFAA encourages members to highlight positive and negative provisions in the PROSPER Act for lawmakers in the House and Senate. December 13, 2017 - Just seconds before the clock struck midnight on Tuesday, December 12, the House education committee voted along party lines to move a bill to reauthorize the Higher Education Act (HEA) to the floor for a full vote. December 4, 2017 - While higher education professionals are still sifting through the House Republicans’ lengthy bill to reauthorize the Higher Education Act (HEA) released Friday, initial reactions focused heavily on condemning proposals to cut various grant and loan programs and eliminate the gainful employment regulations. NASFAA breaks down & compares House Republicans' PROSPER Act and House Democrats' Aim Higher Act in this helpful chart.